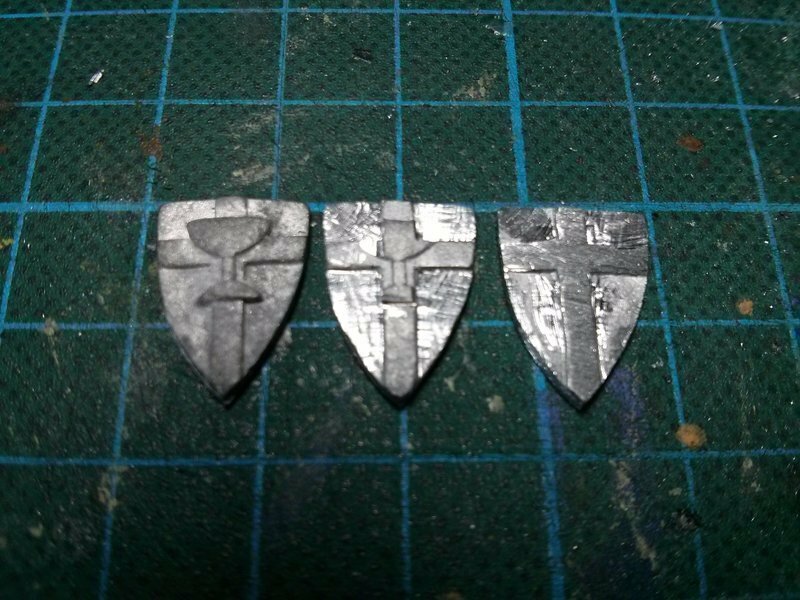 The next unit for my Oldworlder Ally Contingent is an Imperial Templar unit. 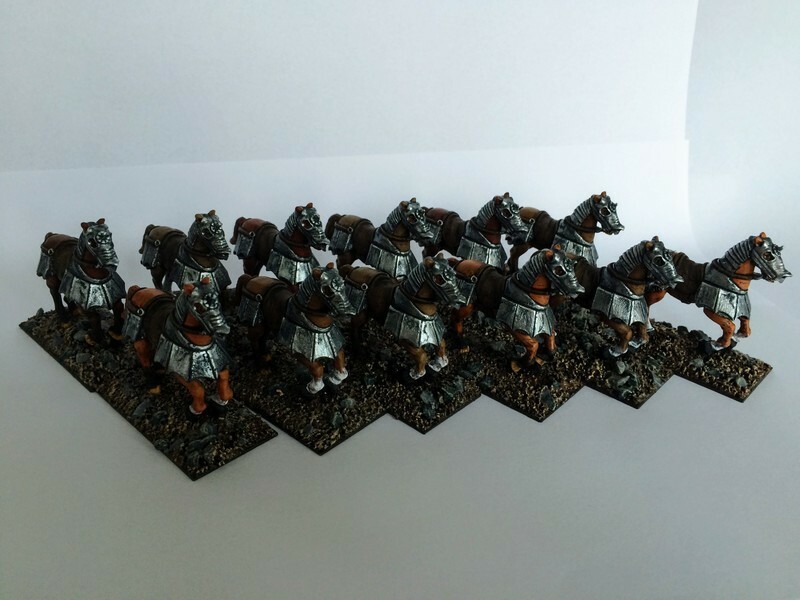 The list allows to field 10 of the heavy cavalry, organized into units of 5+. 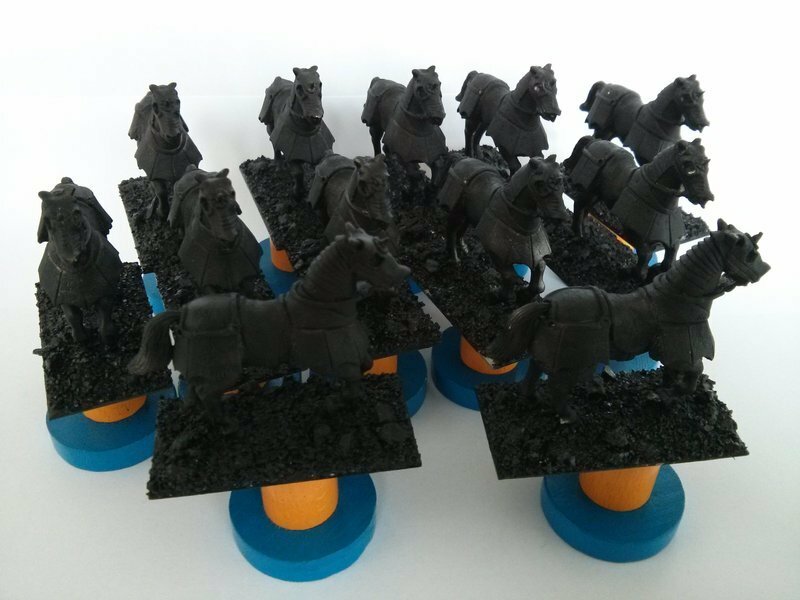 I ordered knights from Black Tree (a custom combination of riders and mounts, which they fulfilled without any problems). 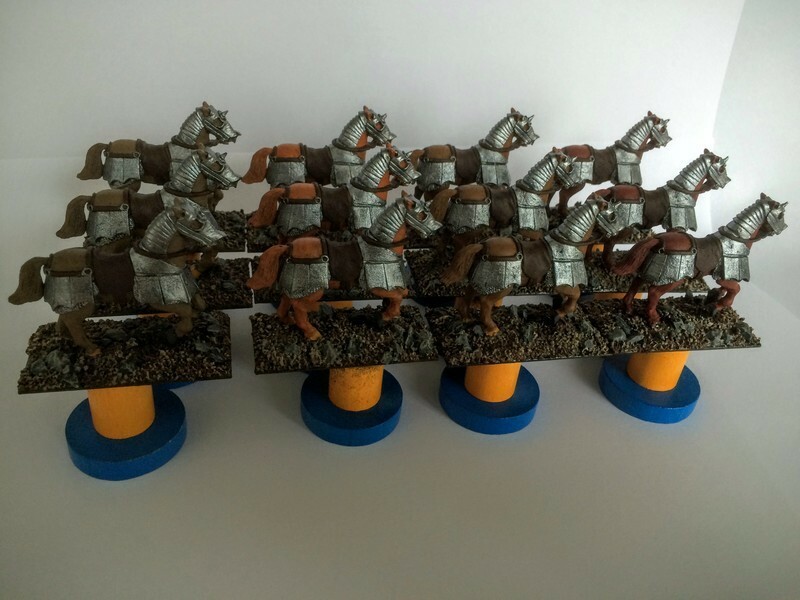 I ordered 8 knights and two each of leader and standardbearer. This allows me to field two units of 5 or one unit of 5-10. A time long ago, at least long enough ago that most exact details have been forgotten or twisted by countless retellings, but not long enough ago for the major part of the story to be lost completely (probably), a group of warriors of noble (we guess, but it sounds more epic for them to have been) heritage, no-one knows if the word 'knight' was already used for them or even did exist back then, was on the prowl to hunt down the evil sorcerer Nieh that plagued the land. Besides being evil, the sorcerer was also cunning, a combination most uncomfortable for the good people of the land - which caused the knights (letâs call them so for the sake of simplicity) to fall for his cleverly laid trap. They were baited into a pentagram, back then another word for a pentangle consisting of five points, created from six (historical sources are sure of that!) pebbles hidden beneath the grass of a rolling plain, when the sorcerer triggered a prepared spell and trapped the knights inside the boundary created by the pebbles. To add insult to injury, he taunted them from outside the magical barrier, by telling them they would only need to place a hawkbit on a certain spot inside the pentagram (some say this was the reason for the sixth pebble of the pentacle) to dispel the spell - the plain was dotted with hawkbits (except inside the five to six pebbles as you should have expected), but of course the knights were not able to cross the magical barrier or even reach through it! So they were trapped in a most wicked way within arms reach of their botanical salvation! Cackling, the sorcerer Nieh went his way to conduct further mischief, now unmolested by any righteous pursuers. The poor knights were trapped inside the pentagram for a long time, no-one exactly remembers how long, probably a bit longer than one would expect, but not nearly as long as one might image in oneâs worst nightmares - anyway, it was short enough for them to survive, but long enough for them to go a bit nuts - not that they ate any nuts during that time, being trapped and all, but somehow they still acquired that trait. Knights: Hey you there, travelling merchants! Knights: We are here on the scheme of... Nieh! Merchants (horrified): No! Not on the scheme of the evil sorceror Nieh?! Knights: The very same! Merchants (among themselves): Those who meet the henchmen of Nieh seldom live to tell the tale! Knights: That is absolutely correct, we saw too many of those massacres! By the way, we need you to do something for us. Merchants: Well, what is it you want? Knights: We want... A > HAWKBIT!!! Knights: Nieh! Nieh!! Nieh!!! Nieh!!!! Merchants: No! No! Please, please, don't call the evil sorcerer upon us! We will find you a hawkbit! Knights: You must return here with a hawkbit... or else you will never pass through this plain... alive. Merchants: O Knights of Nieh, you are just and fair, and we will return with a hawkbit. Knights: One that looks nice. Knights: And not too expensive. Merchants: Yes! Knights: Noowwwww.... GO! Merchant stooped down and plucked a hawkbit. 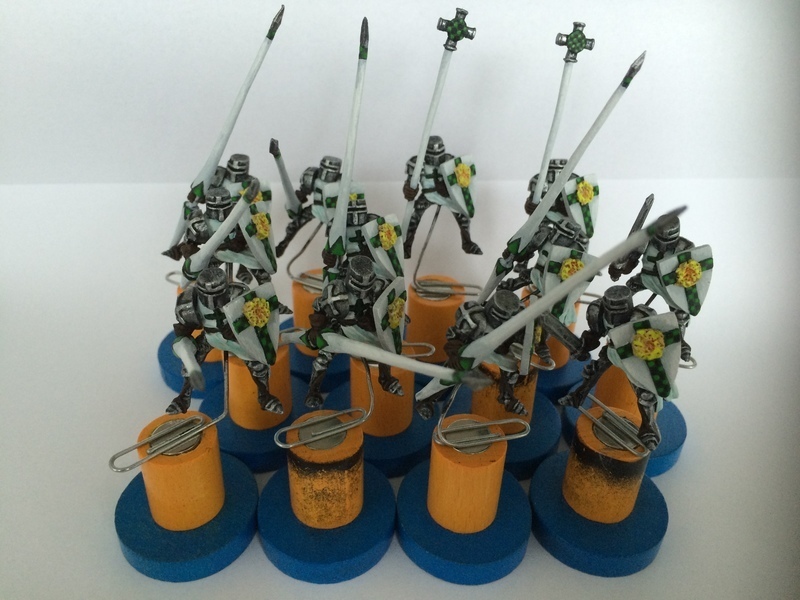 Merchants: O Knights of Nieh. We have brought you your hawkbit. May we go now? Knights: Yes, it is a good hawkbit. I like the petals particularly. The merchants were able to pass the hawkbit through the magical barrier from the outside, but then their arms were trapped as well, and could not be retracted. The Knights placed the hawkbit where the sorcereor Nieh told them to, most probably on the surplus pebble of the five needed to form the pentacle. A glimmer went up around the outline (probably not including the sixth pebble) of the pentagram or some other spectacular effect, sources scintillate on the specific one, and the knights and merchant arms were free again - well, physically that is. Only the knights minds were not as before any more, due to all that isolation, not present legumes and so on. Knights: We are now no longer the Knights of Nieh - we actually never were. We never said so anyway! We are from this point on the Knights of the Hawkbit, eternally sworn enemies of the sorceror Nieh and any evil doers like him! Therefore, we must give you a test to ascertain you are free of all evil! Merchants: What is this test, oh Knights of the Hawkbit? Knights: Firstly, you must find us... ANOTHER HAWKBIT!!! Merchants (mocking but this was probably lost to the knights): Oh no, not another hawkbit! Knights: Indeed! 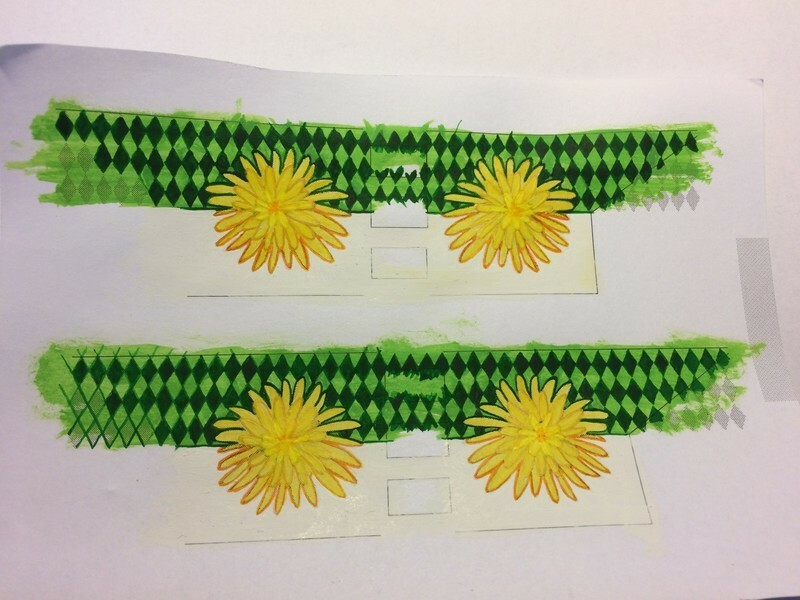 Then, when you have found the other hawkbit, you must place it here, beside this first hawkbit, only slightly higher, so we get a terraced effect with a little path running down the middle. Then, in your capacity as merchants, you must supply us with material to build a castle! This will be our cosy strongpoint from which we will set out to destroy all evil, Nieh first of all! Thus the story of the founding of the Knights of the Hawkbit is told. The castle still stands today, or at least the n-th renovated version of it, the knightly order strong as ever, scouring the land for evil doers, chaos worshippers and monsters, defeating them for the good of the common man - and their pride and history od their order. The center of the castle still proudly displays the terraced hawkbits (the original ones, it goes without saying! ), framed by the six pebbles the pentagram was created from, tended to by a score of five acolytes - the same acolytes whose task it is to extinguish all signs of hawkbits around the castle, for miles, kilometres or any other arbitrary length of measurement; otherwise the two hawkbits inside the castle would not be antyhing special now, would they? One word of warning: There were those who called the mighty Knights of the glorious and manly Hawkbit in a jokey or snidely way the Knights of the Daisy, oftentimes picturing them in a pink coat of arms at the same time - those did not live long or happily after (if at all) when this became known to a Knight of the Hawkbit... How can anyone confuse deep, masculine yellow with light, womenish white petals anyway?! Any similarity to a Programm Snake are fully intentional and no allowance to use their intellectual property was asked for. 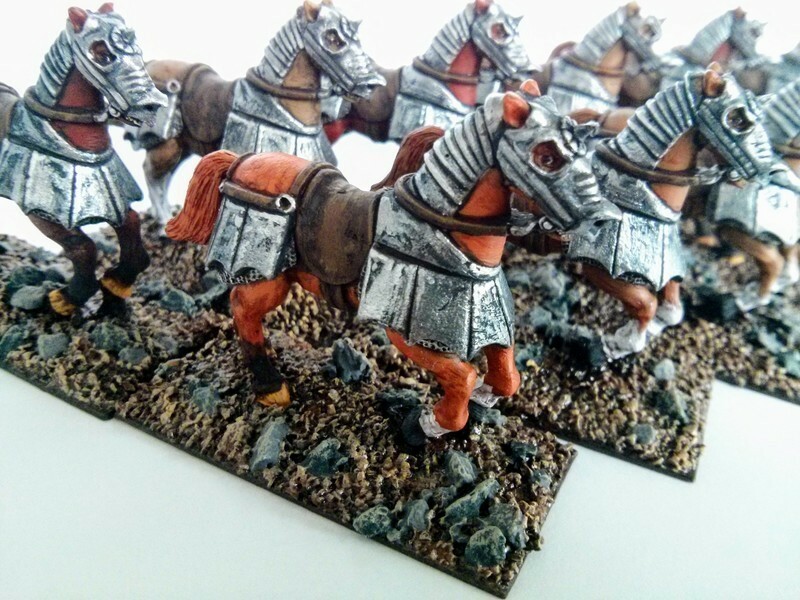 I mounted the horses on metal bases from Products for Wargamers, added spackle and sand, then basecoated the models in black. 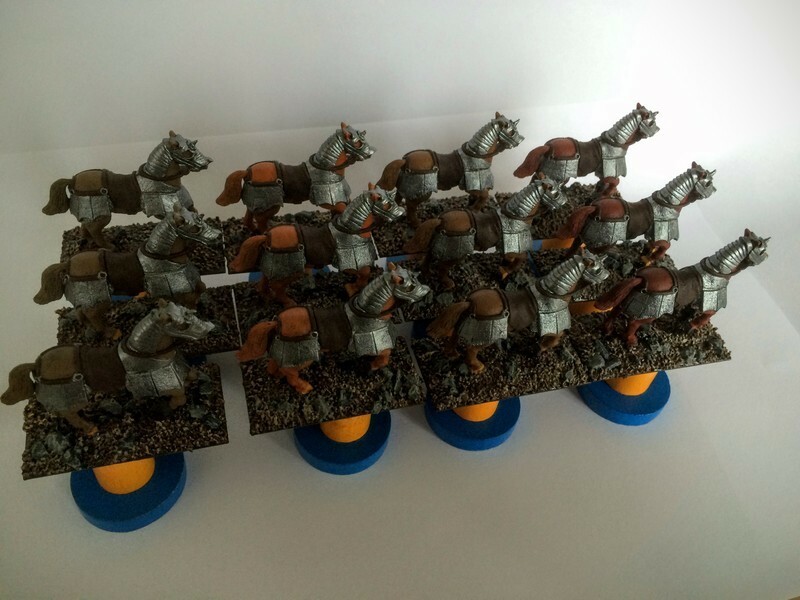 I painted the bases as well as all the base colours on the horses. I choose three different browns as the body colour, which will now be combined with different washes to create twelve unique body colours. Having done the horses, the riders were next. From both the shields and the tunics, I cut away the hearts. 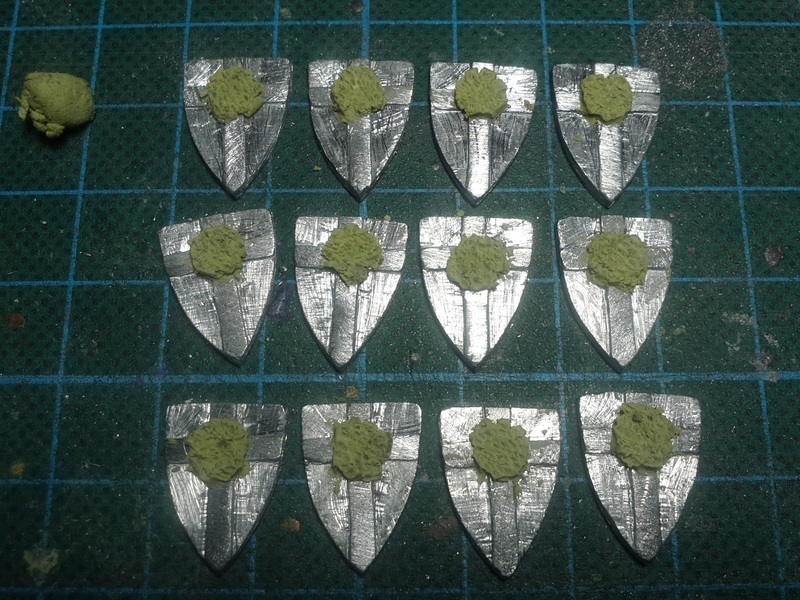 On the shields I modelled on hawkbit petals. 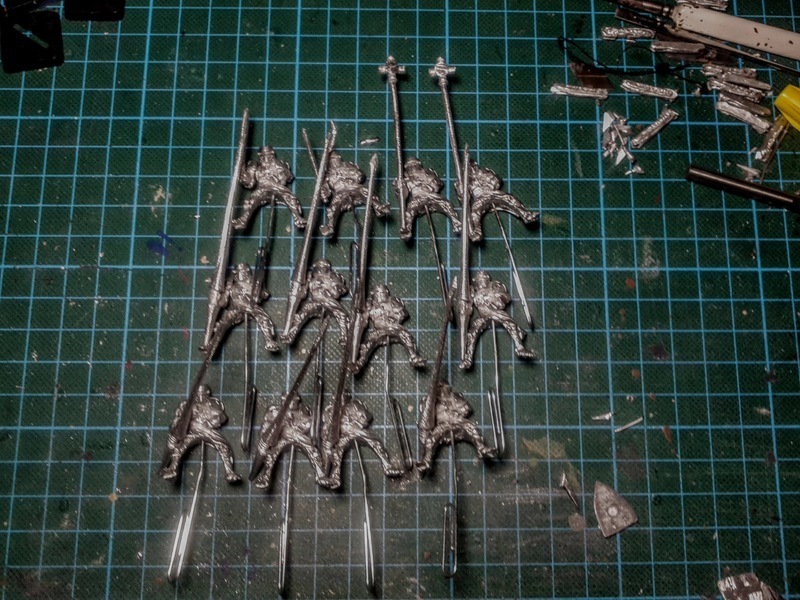 Finally I mounted the models on paper clips for handling while painting. 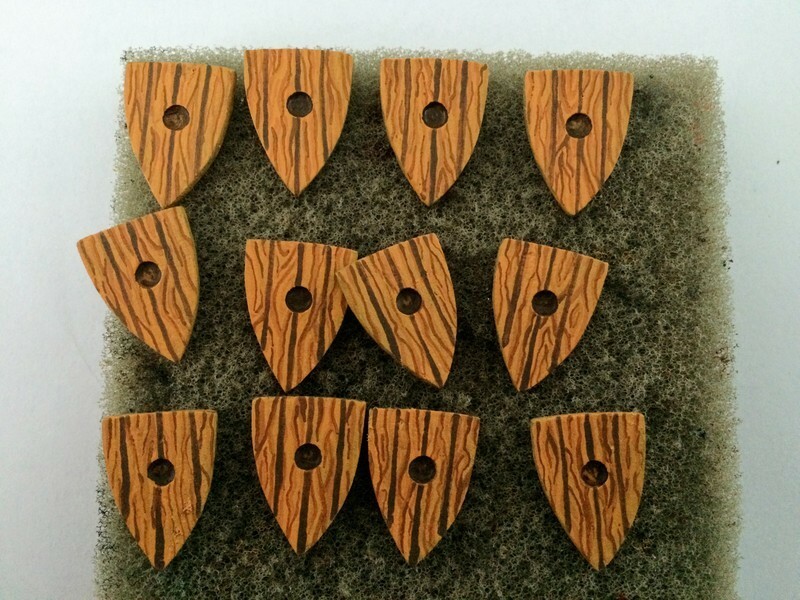 So a light brown base coat, wood grain in two darker browns, and plank lines in a very dark brown later, the backsides of the shields are done. The riders are done. Whether to add more decoration or not I will decide once they are mounted. 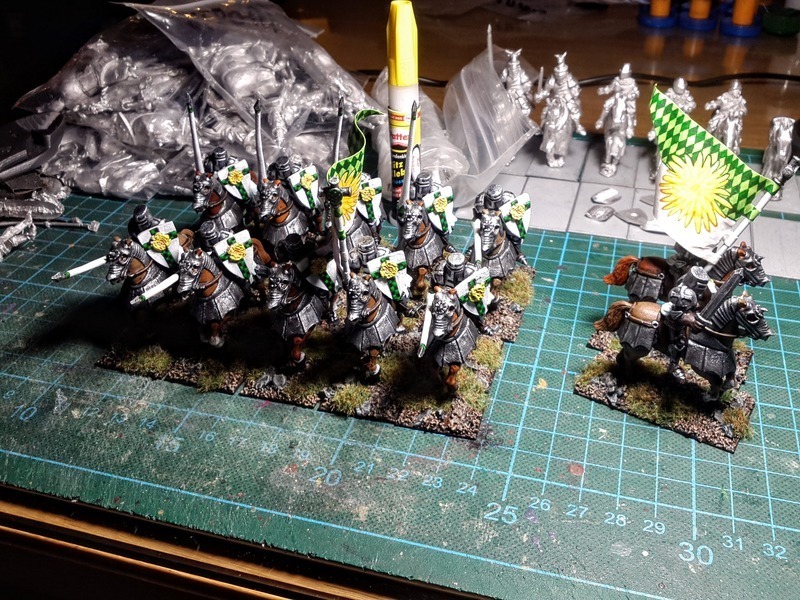 The unit is done; riders mounted, flags attached and greenery added to the base. 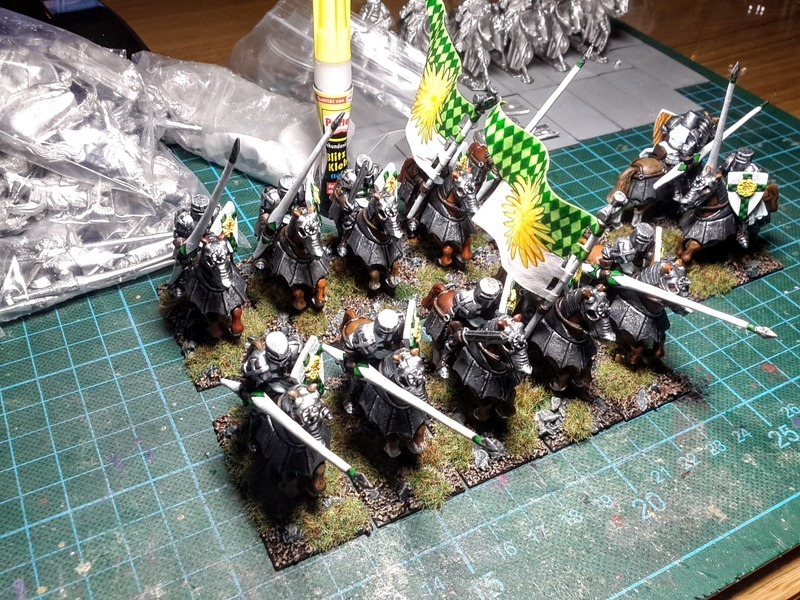 The Oldworlder Ally Contingent allows for 5-10 Templars with a minimum unit size of 5. Here is the finished unit set up as two 5 man units and one 10 man unit. Of course, one unit of between 6 and 9 is also possible.